Known as Curcuma longa, turmeric is a tropical rhizome (under-ground stem) in the ginger family. Its large leaves are sometimes simmered in Malaysian Nyonya cooking. In Thailand the young tender shoots are boiled and used as a vegetable. 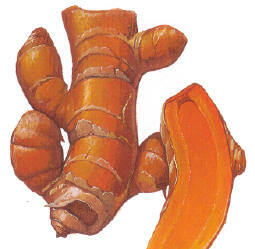 Most turmeric however is cultivated on a large scale to yield its brilliant orange-yellow rhizome (pictured above). The short, waxy rhizomes are boiled, cleaned, sun-dried and then ground to a fine aromatic yellow powder – the ubiquitous turmeric powder used throughout India, Asia and beyond to impart its familiar warm, yellow-orange glow to cooking. Not so well known is the fact that the rhizomes are also used fresh, and here in Australia fresh turmeric root is grown commercially, and can be found at well-stocked fruit and vegetable outlets and Asian suppliers. It is a delight to use fresh, but must be handled with great care because as soon the rhizomes are cut, they can seriously stain fingers, aprons, even cutting boards and knives. I usually grate them while wearing disposable kitchen gloves. I love to use fresh turmeric in long-cooking dishes like dals and moist vegetables to give the fresh product time to do its magic. I also fry fresh turmeric with grated fresh ginger in any recipes that ask for powdered turmeric, and I use it in double quantities. In other words, if a recipe calls for ½ teaspoon powdered turmeric, I will use 1 teaspoon of the fresh. Used fresh, its slighty bitter and pungent flavour is unsurpassable. Turmeric is not just a pretty face. In Chinese medicine, turmeric is known to stimulate circulation, resolve bruises and clots, strengthen the gall bladder, inhibit dangerous blood clotting, reduce liver toxins, act an anti-inflammatory, and help metabolise fats. It is also revered in India’s Ayurveda as the most natural antibiotic, even surpassing echinacea, and as the most potent of all blood purifiers. It is also recommended as the best herb to regulate womens’ menstrual periods and as a powerful tonic for womens’ reproductive organs.